Pico FlexRes® Oscilloscopes allow you to reconfigure the hardware either to increase the sampling rate or the resolution. For the first time in an oscilloscope you can reconfigure the hardware to be either a fast 8-bit oscilloscope for looking at digital signals or a high-resolution 16-bit oscilloscope. Whether you're capturing and decoding fast digital signals or looking for distortion in sensitive analog signals, flexible resolution allows you to do both in the same oscilloscope. FlexRes® flexible resolution - how does it work? In time-interleaved mode, the ADCs are interleaved to provide 1 GS/s at 8 bits (see diagram). Interleaving reduces the performance of the ADCs, but the result (60 dB SFDR) is still much better than oscilloscopes that interleave 8-bit ADCs. This mode can also provide 500 MS/s at 12 bits resolution. In parallel mode, multiple ADCs are sampled in phase on each channel to increase the resolution, revealing every detail of the signal in a crystal-clear display. Sampling in parallel with multiple ADCs and combining the output reduces noise and also both the integral and differential nonlinearity, providing outstanding dynamic performance. Using parallel mode, resolution is increased to 14 bits at 125 MS/s per channel (> 70 dB SFDR – see diagram). If only two channels are required then resolution can be increased to 15 bits, and in single-channel mode all the ADCs are combined to give a 16-bit mode at 62.5 MS/s. The software gives the choice of selecting the resolution or leaving the scope in “auto resolution” mode where the optimal resolution is used for the chosen settings. Most modern oscilloscopes (including all PicoScopes) have the ability to average or filter 8-bit data to reduce noise and increase effective resolution. Typical names for such modes are Resolution Enhance, High Definition Mode and HiRes Mode. While these modes are valuable for some applications, each 0.5 bit increase in resolution halves the sampling rate, reducing the effective bandwidth and risking aliasing. The table below compares the PicoScope 5000 Series with a typical 8-bit oscilloscope with a 1 GS/s sampling rate. Flexible resolution offers a sampling rate up to 4000 times faster than traditional methods. The PicoScope 5000 range of Flexible Resolution Oscilloscopes offer an impressive maximum sensitivity of 2 mV/div at the full resolution of the oscilloscope (many oscilloscopes use software zoom to provide the most sensitive ranges). If you need more sensitivity then enable the high resolution modes. The example opposite shows how 14-bit mode and zoom can be used to provide 100 μV/div sensitivity while still providing more than 8 bits of resolution. At such low signal levels, noise can become significant so the PicoScope 5000 Series includes both a hardware bandwidth limit (20 MHz) and software programmable filters (high pass, low pass, band pass and band stop). Even in 8-bit mode, flexible resolution offers an advantage over other oscilloscopes. Interleaving ADCs to increase sampling rate always introduces errors that reduce the effective resolution. Often 1 or 2 bits of resolution are lost, reducing the effective resolution to 6 bits. With Flexible Resolution, interleaving the high-resolution ADCs results in a near-perfect 8-bit result. While the averaging and resolution enhance modes available on most oscilloscopes are effective at reducing noise, the method used (combining samples from a single ADC) does not remove linearity errors. Flexible Resolution improves on this in two ways. First it uses high-resolution ADCs (with inherently low linearity errors). Secondly, by sampling the same signal with up to 8 different ADCs at once, both the differential and integral nonlinearities are reduced. Of course, the dynamic performace of an oscilloscope is not just dependent on the ADCs. Designing a low-noise, low-distortion front end for a Flexible Resolution oscilloscope is a challenging task. Fortunately Pico has well over 20 years' experience in designing high-resolution oscilloscopes. The result is an oscilloscope with outstanding performance and versatility. 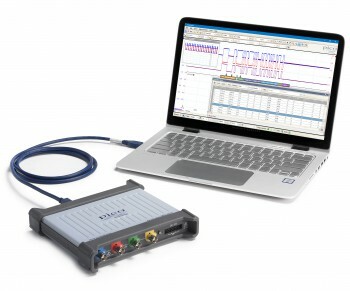 Flexible resolution oscilloscopes address mixed-domain application challenges.